Funky Chunk Candles are some of our most attractive designs. They usually feature a number of colours which intermingle. When lit from behind - if standing on a windowsill, for example - they can appear to glow, even when not lit! Each of these candles is completely unique. 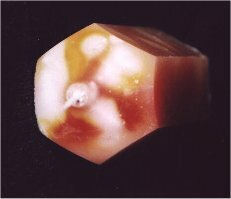 Top View of a Chunk Candle, showing the intermingled colours. 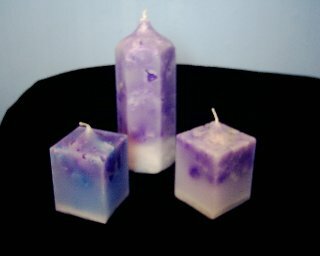 A small group of chunk candles. The cubes are approx. 7cm tall while the Pencil shaped is around 16cm.